If this face-up card in the Field Zone is sent to the Graveyard or banished: Destroy all monsters you control. 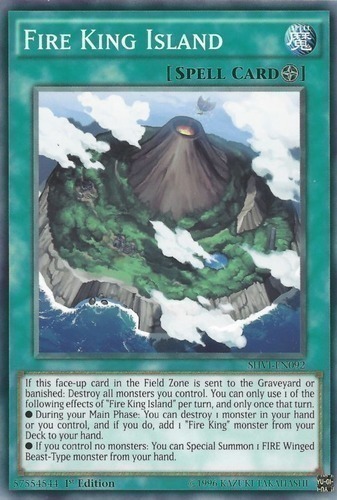 You can only use 1 of the following effects of "Fire King Island" per turn, and only once that turn. ● During your Main Phase: You can destroy 1 monster in your hand or you control, and if you do, add 1 "Fire King" monster from your Deck to your hand. ● If you control no monsters: You can Special Summon 1 FIRE Winged Beast-Type monster from your hand.